Last year, Angus wrote about the oak processionary moth (OPM), which has arrived in this country from Southern Europe. Despite some extreme temperatures over the winter months, the moth has survived and is causing problems again. The featured image (opposite) is from http://www.forestry.gov.uk/fr/INFD-6URJCF. 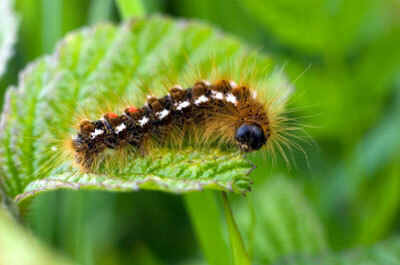 Its caterpillars feed voraciously on oak trees so that many leaves are destroyed. This loss of leaves means that the photosynthetic activity of the tree is reduced, and it cannot make the sugars / starches – which are used as the building blocks for other compounds. In a year when many trees are already stressed by the ‘drought’ an attack by OPM could tip the balance for any particular tree. The caterpillar is covered in many tiny, toxic hairs – the toxin is a substance called thaumetopoein. Contact with these hairs can cause itchy eyes and skin, and may also trigger asthma attacks. At the moment the main area of infestation is certain London boroughs, which are desperately trying to eliminate the insect. Last month, it turned up in Pangbourne in Berkshire. It is thought that the moth /eggs originally arrived on oak trees imported for a housing development. Further information about the work being done to contain the outbreak at Kew Gardens can be found here. Parts of the Gardens have been temporarily closed this month whilst spraying has been carried out. Now all oak trees imported into the UK from the European Union need a ‘passport’ / certificate to confirm that they are OPM free. The Forestry Commission is working hard to try to contain the spread of this insect, as is the London Tree Officers Association . “Anyone who thinks they have found oak processionary caterpillars or their nests should not touch them or attempt to remove them, but should report their sightings to Forest Research or the relevant local Council, giving as precise details as possible about the location. An accurate postal address with the full postcode, and/or a clear description of the tree's exact position, is helpful. Digital photos sent with emailed sighting reports can help experts to confirm the sighting. Sightings anywhere can be reported to Forest Research by telephoning 01420 22255 or by email to [email protected]. ” quote from the Health Protection Agency website. The Non Native Species Secretariat (NNSS) says “Please report any sightings as soon as possible” ;there is a map which shows the known distribution of this moth – clearly it has spread since last year - and a factsheet, all on their website. Some councils have addressed the problem of brown tail moth infestations by using pheromone traps. These release a ‘scent’ that attracts males, and therefore interferes with the normal breeding cycle – see http://www.portsmouth.gov.uk/living/3617.html . The brown tail moth is native to the UK and has natural predators here. It is found along the coast of south east England (in particular) but may be found in northern areas in some years. 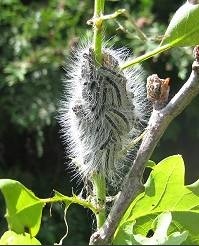 The caterpillars shelter in silken tents (often towards the top of trees) during the winter months. This gives detailed information about the life cycle of the moth and advice on its removal / control. Again, it is important to head the warnings about the hairs and effects of this particular caterpillar. Niece has just given me a container full, found loads in filmer road childrens park, dedworth, windsor, they are swarming over the gate. I live in Plymouth, had a problem in the Spring with this Caterpiller, it was found on my roses, again, to-day found mn my Roses, have tried spraying with a Rose Bug Killer, but, unsuccesful. Hope someone out there can help. Just found one of these in my back garden on trampoline , must of fell off something when my son was jumping, in bury at edmunds . Found two at the alloment , my grandchild held them . this was two weeks ago , willshe be ok now.rach leicester..
Oak Processionary Moth – a UK health threat?